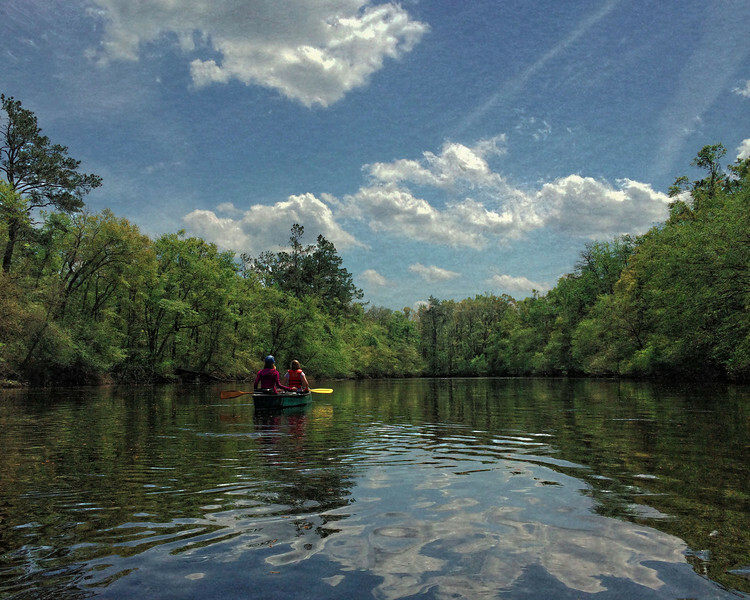 For Christmas 2013, my daughters game me an overnight canoe trip with them on the Edisto River in South Carolina. According to Wikipedia, The Edisto River is the longest free flowing blackwater river in North America, flowing over 250 meandering miles from its sources in Saluda and Edgefield counties, to its Atlantic Ocean mouth at Edisto Beach, South Carolina. It rises in two main tributaries (North Fork & South Fork) from springs under the Sandhills region of West Central South Carolina, just to the south of the Piedmont fall line. It is the longest and largest river system completely contained by the borders of South Carolina. Its name comes from the Edisto subtribe of the Cusabo Indians. We rented a canoe and a kayak (for me) at Carolina Heritage Outfitters near St. George and rowed about 14 miles to one of three tree houses the company operates on the river. Pit toilet and no electricity, although there is propane for cooking and cooking and eating utensils. The next morning we got up and rowed about 10 miles, back to the office area. Our trip was in early April, and the early spring leaves provided a brilliant green cast to the river. Hope you enjoy these shots from the trip.